Openshift is a Paas platform offered by Red Hat based mainly on Docker and Kubernetes. One of the concepts behind it is that Ops can set boundaries for Dev. For example by providing a list of supported technologies in the form of base images. One other way Ops can further control the Paas cluster is to impose various limits on the components running in Openshift. However, Openshift currently has three different ways of setting restrictions on different levels which do interconnect in an implicit way. Which sometimes can become difficult to setup in a proper way and people end up with Pods never leaving the “Pending” state. So in this blogpost we are going to take look at the different limits or restrictions available in Openshift and how they influence each other. But to understand the restrictions better it is good to know some basic Openshift concepts and components on which these limits act. Although I highly recommend to start experimenting with restrictions and limits after you become familiar with Openshift. The basic units of OpenShift applications are called containers. Linux container technologies are lightweight mechanisms for isolating running processes so that they are limited to interacting with only their designated resources. Many application instances can be running in containers on a single host without visibility into each others’ processes, files, network, and so on. Typically, each container provides a single service (often called a “micro-service”), such as a web server or a database, though containers can be used for arbitrary workloads. The Linux kernel has been incorporating capabilities for container technologies for years. More recently the Docker project has developed a convenient management interface for Linux containers on a host. OpenShift and Kubernetes add the ability to orchestrate Docker containers across multi-host installations. 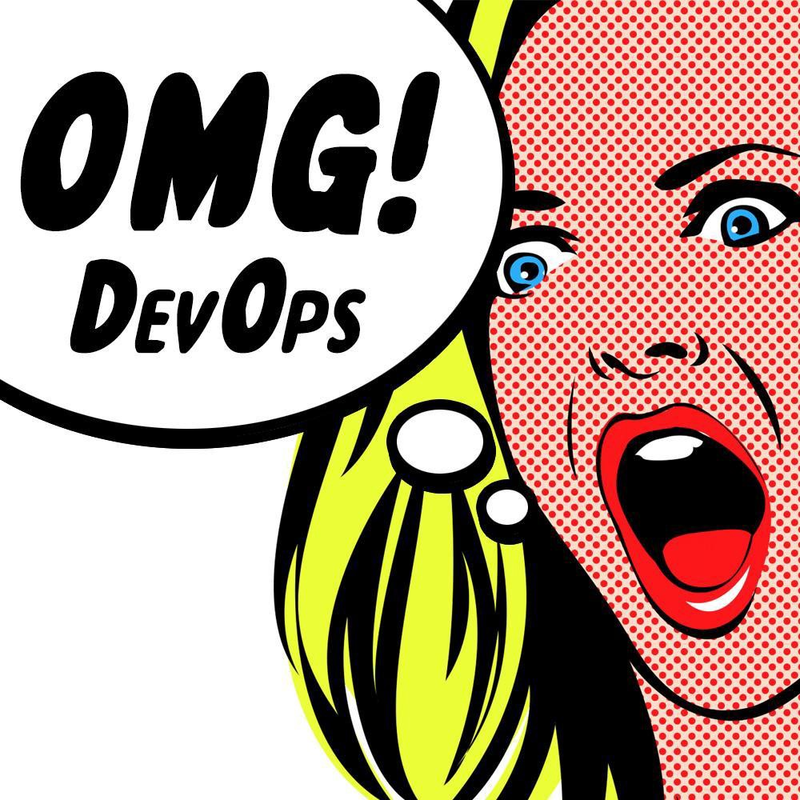 OpenShift leverages the Kubernetes concept of a pod, which is one or more containers deployed together on one host, and the smallest compute unit that can be defined, deployed, and managed. A Kubernetes namespace provides a mechanism to scope resources in a cluster. In OpenShift, a project is a Kubernetes namespace with additional annotations. Named resources to avoid basic naming collisions. Delegated management authority to trusted users. The ability to limit community resource consumption. 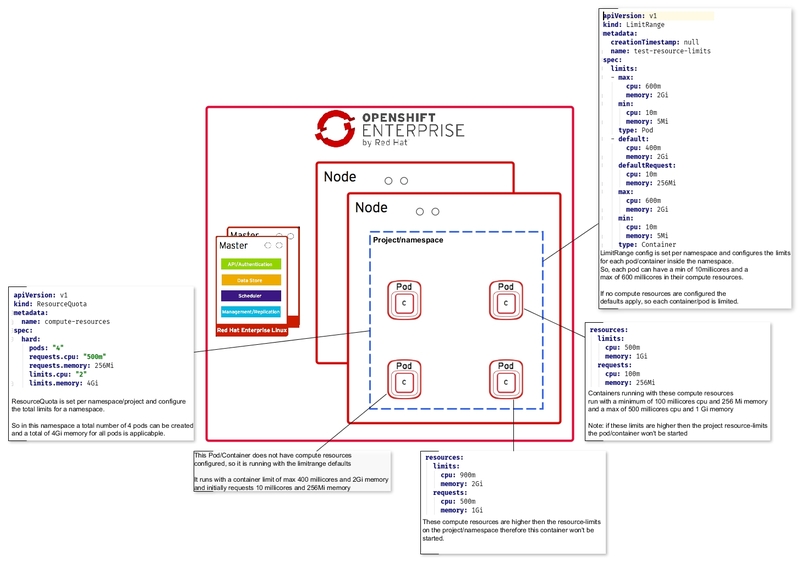 Most objects in the system are scoped by namespace, but some are excepted and have no namespace, including nodes and users. The Kubernetes documentation has more information on namespaces. There are three different types of limits and restrictions available in Openshift. Quotas are boundaries configured per namespace and act as a upper limit for resources in that particular namespace. It essentially defines the capacity of the namespace. How this capacity is used is up to the user using the namespace. For example if the total capacity us used by one or one hundred pods is not dictated by the quota, except when a max number of pods is configured. This quota says that the namespace can have a maximum of 5 pods, and/or a max of 2 cores and 2 Gb of memory, the initial “claim” of this namespace is 500 millicores and 512 Mb of memory. Now it is important to note that by default these limits are imposed to “NonTerminating” pods only. Meaning that for example build pods which terminate eventually are not counted in this quota. There are also other scopes available, like Best effort and guaranteed. One other type of limit is the “limit range”. A limit range is also configured on a namespace, however a limit range defines limits per pod and/or container in that namespace. It essentially provides CPU and memory limits for containers and pods. Here we can see both Pod and Container limits. These limits define the “range” (hence the term limit range) for each container of pod in the namespace. So in the above example each Pod in the namespace will initially claim 200 millicores and 6Mb of memory and can run with a max of 1 GB of memory and 2 cores of CPU. The actual limits the Pod or container runs with can be defined in the Pod or Container spec which we will discover below. However the limit range defines the range of these limits. Another thing to note is the default and defaultRequest limits in the Container limit range. These are the limits applied to a container who do not specify further limits and hence get assigned the default. The last of the limits is probably the easiest to understand, compute resources are defined on the Pod or the Container spec, in for example the deploymentconfig or the replication controller. And define the CPI and Memory limits for that particular pod. In the above spec the Pod will initially claim 100 millicores and 200 Mb of memory and will max out at 200 millicores and 400 Mb of memory. Note whenever a Limit range is also provided in the namespace where the above Pod runs and the compute resources limits here are within the limit range the Pod will run fine. If however the limits are above the limits in the limit range the pod will not start. All limits have a request and a max which define further ranges the Pod can operate on. Where the request is by all intense and purposes “guaranteed” (as long as the underlying node has the capacity). This gives the option to implicitly set different QoS tiers. BestEffort – no limits are provided whatsoever. The Pod claims whatever it needs, but is the first one to get scaled down or killed when other Pods request for resources. Burstable – The request limits are lower than the max limits. The initial limit is guaranteed, but the Pod can, if resources are available, burst to its maximum. Guaranteed – the request and max are identical, so it directly claims the max resources, even though the pod might not initially use all resources they are already claimed by the cluster, and therefore guaranteed. Below is an overall view of the three different Openshift limits. Recently I spent some time experimenting with the Fabric8 microservices framework. And while it is way too comprehensive to cover in a single blog post I wanted to focus on deploying an App/Microservice to a Fabric8 cluster. For details on to setup your fabric8 environment using minikube you can read the excellent blog post of my collegue Dirk Janssen here. 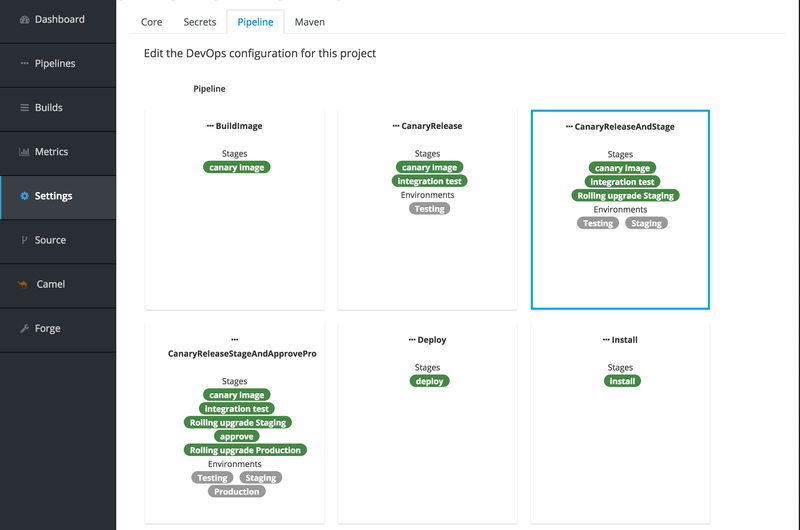 So in this blog I will outline how to create a basic Camel/CDI based microservice using maven and deploy in on a kubernetes cluster using a fabric8 CD pipeline. I used a maven archetype to quickly bootstrap the microservice. 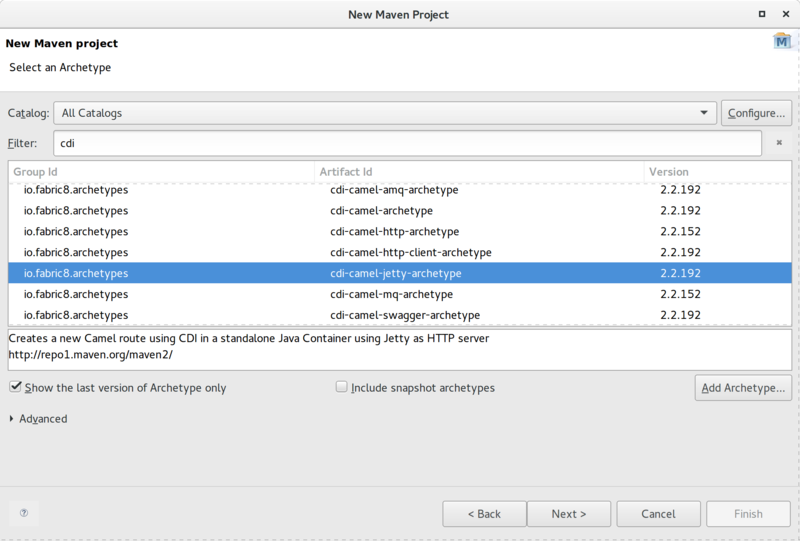 Now I used the Eclipse IDE to generate the project, but you can off course use the Maven CLI as well. Fabric8 provides lots of different archetypes and quickstarts out of the box for various types of programming languages and especially for Java various frameworks. Here I am going with the cdi-camel-jetty-archetype. This archetype generates a Camel route exposed with a Jetty endpoint wired together using CDI. 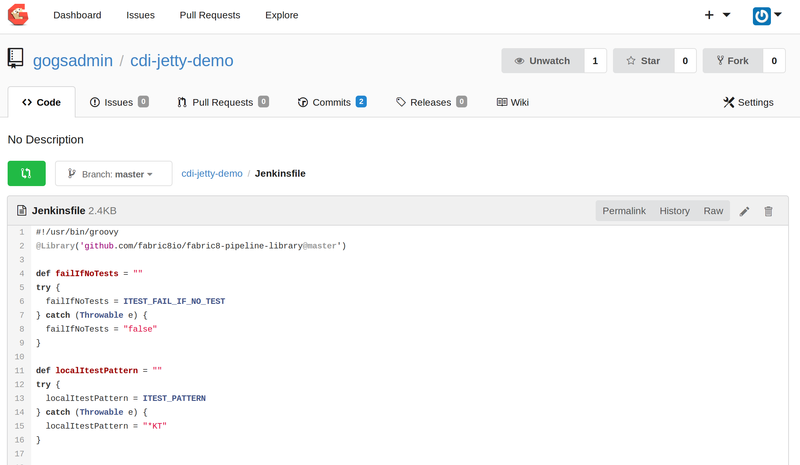 Since the archetype did not have a template in cdi-jetty-demo/src/main/fabric8 and was still looking for it there it was throwing an error. After some looking around I managed to solve the issue by using a different version of the fabric8-maven-plugin. Now running the clean install was executing successfully. After the project built successfully I wanted to run it in my Kubernetes cluster. Thankfully the guys at fabric8 also took this into consideration, so by executing the maven goal fabric8:run you app will be booted into a Docker container and louched as a Pod in the Kubernetes cluster just for some local testing. [INFO] Pod> 2016-12-28 11:28:53,412 [main           ] INFO  Bootstrap                      - WELD-000101: Transactional services not available. Injection of @Inject UserTransaction not available. Transactional observers will be invoked synchronously. [INFO] Pod> 2016-12-28 11:28:53,605 [main           ] INFO  Event                          - WELD-000411: Observer method [BackedAnnotatedMethod] private org.apache.camel.cdi.CdiCamelExtension.processAnnotatedType(@Observes ProcessAnnotatedType<?>) receives events for all annotated types. Consider restricting events using @WithAnnotations or a generic type with bounds. [INFO] Pod> 2016-12-28 11:28:55,226 [main           ] INFO  DefaultCamelContext            - Total 1 routes, of which 1 are started. [INFO] Pod> 2016-12-28 11:29:52,307 [Thread-12      ] INFO  MainSupport$HangupInterceptor  - Received hang up - stopping the main instance. thirst the App is not by default exposed outside of the Kubernetes cluster. I will explain how to do this later on in this blog after we have completely deployed the app in our cluster. After running and testing our microservice locally we are ready to fully deploy our microservice in our cluster. For this we also start with a Maven command, mvn fabric8:import will import the application (templates) in the Kubernetes cluster and push the sources of the microservice to the fabric8 git repository based on Gogs. After the successful execution of the import goal we need to finish the setup further in the fabric8 console. First we need to setup a Kubernetes secret to authenticate to the Gogs Git repository. Next we can select a CD pipeline. After we have selected a CD pipeline suited for the lifecycle of our Microservice the Jenkinsfile will be committed in Git repository of our microservice. And after that Jenkins will be configured and the Jenkins CD pipeline will start its initial job. If everything goes fine the entire Jenkins pipeline will finish successfully. Being able to quickly deploy functionality across different environments and not have to worry about runtime config, app servers, and manually hacking CD pipelines is definitely a major advantage for every app developer. For this reason the fabric8 framework in combination with Kubernetes really has some good potential. Using fabric8 locally with minikube did cause some stability issues, which I have not fully identified yet, but I’m sure this will improve with every new version coming up.